Below is the latest collection of Bagno Sasso Swiss company, was named Ocean Wave & Ocean Wing, with a unique design for modern bathrooms. The tub has a main structure made of Corian, thus creating an organic form and dramatic as possible. An amazing bath, presented exclusively for you, provide comfort and a pleasant bathing experience, creating a relaxed atmosphere for your luxury bath. Karen extraordinary form, you can put it right in the middle of your room, with natural wood elements of Corian create the feel of a warm and hygienic. Materials and shapes with a harmonious blend gives a modern edge bathtub, which is the key of this tub. Together with the Swiss company Bagno Sasso I developed this new bathtubs Ocean wing Ocean wave. Both are unique objects which fit perfectly into the modern bath lounge. 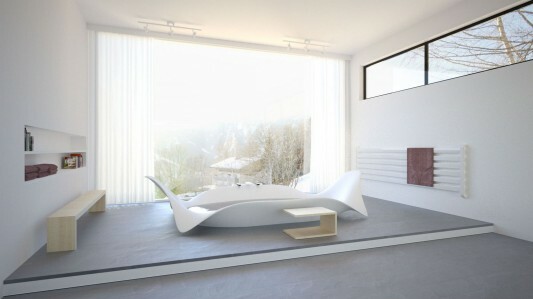 The main structure of both bathtubs is made out of corian which makes the organic and dramatic forms possible. Ocean Wave is a celebration of a relaxing bath. The spacious and elegant impression invites the resident to take time and escape from the everday life. Because of its extraordinary form it is meant to be placed in the centre of the room. Ocean Wing plays with the natural element of wood outside and the warm and hygienic corian in the inside. The contrast of this materials and the form, which combines this two harmonically, are the key design elements of this bathtub. Dimensions: Ocean Wing: 2250 x 1000 x 750mm, Ocean Wave: 3000 x 1500 x 780mm, Both models are prototypes at the moment.